Testimonials and reviews about the 5 Day Pouch Test and shared on this site are the unedited opinions of people who have regained confidence in themself and their surgical tool using the 5DPT. All reviews were made voluntarialy and no compensation has been awarded in favor of positive reviews. See more reviews on LivingAfterWLS Amazon and the LivingAfterWLS Bookstore. Grateful for 5DPT "I, for one, am so glad you created the 5DPT so that I would not have to do all the research myself to figure out how to get back on track. Sure it would have been easier if I never got off track, but once off, I needed you and I'm so glad I found you! Family Success: "I'm so thankful for Kaye Bailey and her books, and products. Certainly changed my journey for the better. But it's targeted toward weight loss surgery patients but my 40 yr old daughter and my 68 yr old husband went on 5 day pouch test with me and were astounded they also lost 8 lbs in 5 days and are both continuing to eat low carb, high protein foods with me and both have now lost 30 lbs each.we are all thrilled and feeling so much better. Tremendous Help! "Kaye I am so thankful for your books and support! You have helped me tremendously!" Felt In Control: "I have tried the 5DPT. I haven't been able to complete it due to mental hang ups that I'm working through but I whole-heartedly believe this truly works. The few days I did do, I felt a difference and felt in control. One day I'll complete it. I thank you for all of your work, as many of us do. We focus so much on the negativity at times that it over shadows the positive. Just know that yours is the best one out there that beats down the other gimmicky "back on track" so-called programs." Good Research: "All of us here appreciate the research work you do on our behalf. 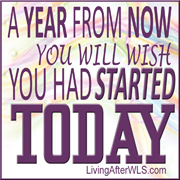 Please continue to be our advocate, cheerleader, and guru for Living after WLS." A MUST have for WLS patients!, September 4, 2013 I had WLS 3 years ago next week. This book is the most helpful of all the many books I bought. As a matter of fact, it's place is in my kitchen drawer. It's always at my finger tips for referral. The recipes are the best too. My entire family eats the food I cook out of the book so I have to cook double. The 5 Day Pouch Test is a must have reference. The best help of all for WLS patients!! Must Have, November 4, 2013 I had read all the information on 5DayPouchTest.com, but you just get so much more out of this book this book ! If you are considering doing the five day test I think this is a must have and so worth it! I love this book, July 30, 2014 I love this book . It helped me get back to basics and start my journey again. To all who doubt.. don't, it will help and give you back your determination. Getting back on track, January 14, 2014 I love this book. It has helped me re-define my eating and exercise goals. It reminded me, in different wording, of the basic rules of bariatric surgery. I have recommended it to several of my friends and my doctor. Everything that has Kaye's name on it is AWESOME." Kaye Bailey has done it again. This express guide is just what I needed with my busy life. It is short and to the point. It will be great to take my Kindle into the grocery store and shop for 5DPT items easily. The recipes look delicious too!" This is the encouragement that I needed to get back on track. The author answers your questions that you have to get started and to completed your 5 days with getting back on track."